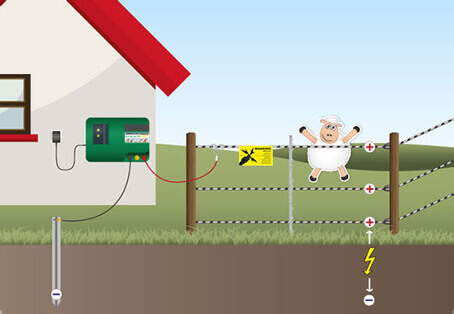 The heart of any electric fence system is the energiser. 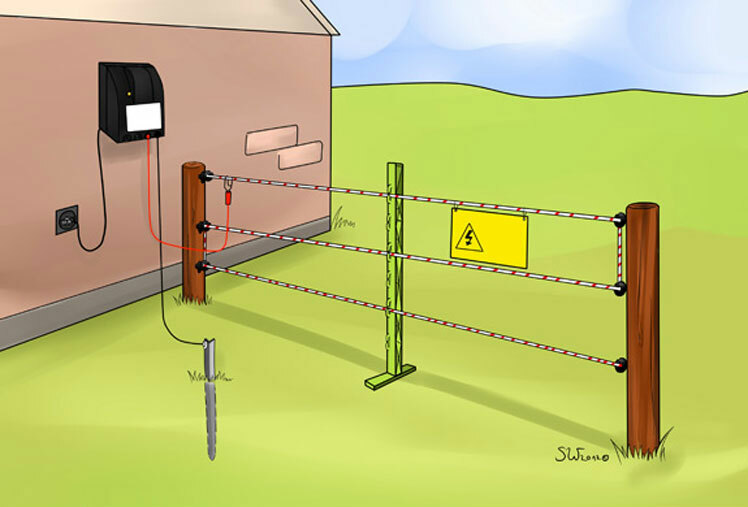 This is connected both with the earth (grounding) and with the conducting material in the fence. The energiser creates regular high-voltage impulses that generate a voltage between the conducting material and the ground. When an animal (or a person, vegetation or similar) creates a connection between the ground and the conducting material, the circuit is completed. A current then flows from the energiser, through the conducting fence material, through the animal and then finally through the ground and the grounding post back to the energiser. This current feels very unpleasant (electric shock) and results in the desired deterrent effect. The energiser creates regular electrical impulses. These impulses are unpleasant, but not dangerous to people or animals as they only act for a short period of time. The impulse occurs approximately every 1.3 seconds and lasts for a matter of milliseconds. Touching this is still unpleasant, however, and results in the desired deterrent effect. 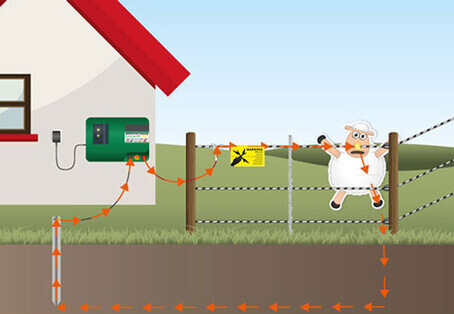 Electric fences are long-lasting, simple to put up and great value for money compared with normal fences. Furthermore, the risk of injury is significantly lower than with barbed wire fences. These fences serve not only to enclose an area, but also act as a deterrent e.g. to protect against wild boars. The animal completes the circuit. The current flows back to the energiser via the ground and grounding stake. The fence must not connect back round to itself and can end at any point. Since the electric pulse only lasts a short period of time, the animals will be frightened when touching the fence and quickly retreat.